Got out for a few days hunting with a mate the other day. 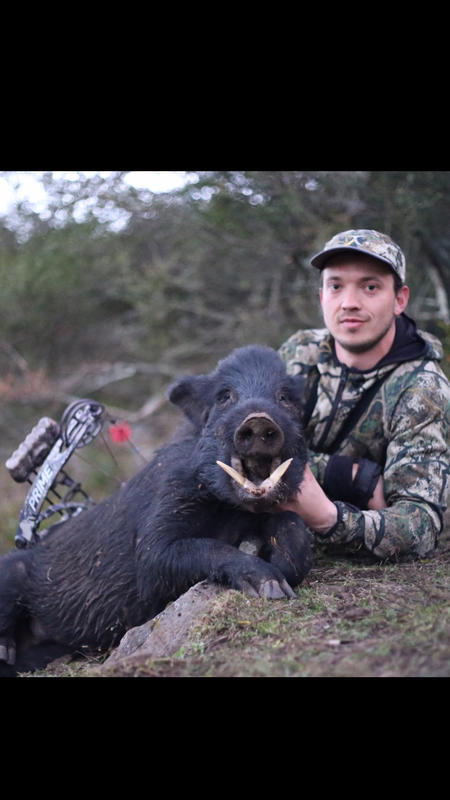 Shot this boar from around 10m and watched him run around 15m and pile up. I was going to pass him up cos he didn’t look like anything special on the hoof but when I saw a bit of lip curl I couldn’t pass him up. he would have been flat out being 40kgs. Gotta be happy with that! Well done! Nice one! Don't have to be big bodied to have a decent set of hooks. If you don't do it, you won't do it, and if at first you don't succeed, it's more than likely because you're crap at it. He's a cracking little boar mate, how did he pull? Haven’t had a chance to boil him out I’m away for work at the moment but once I boil him out I’ll let you know how he scored.